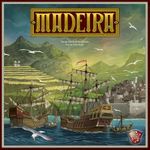 So Essen has come and gone and most of us have updated our wishlist with an almost fanatical fever. There are always those games that will have a short print run and be talked about in hushed tones after the conventions, but will never have a wide distribution. I am going to start off with a few games from this years Essen and go from there. I will have to wait to get a chance to play it but given how limited the English release was I don't see it happening. This should get licensed by several companies given its reception so I can only hope it will be a matter of time before more copies making the rounds. A good fit for AEG's Big In Japan line, I would like the art to stay this time around. Another Japon Brand/Grounding game, another sensible pickup for AEG. I hope the theme would survive but I could see this being adapted as a European merchant for their tempest line. Honestly this could be almost any Fragor game, since Snow Tails was picked up there is a shot for this as well. Not much in the way for text so might be more of an import and go title. Only a matter of time before another company picks this up I would imagine.